This guide assumes that you have installed Express Edition on your Windows or Linux system, as described in Oracle Database Express Edition Installation Guide for Microsoft Windows and Oracle Database Express Edition Installation Guide for Linux x86-64. On Windows, from the Start menu, select Programs (or All Programs), then Oracle Database 11g Express Edition. On Linux, click the Application menu (on Gnome) or the K menu (on KDE), then point to Oracle Database 11g Express Edition. Go To Online Forum: Displays the online forum for discussions about Oracle Database XE. Read Documentation: Displays the Oracle Database XE documentation library on the Internet. Register For Online Forum: Allows you to register for the Oracle Database XE online forum. Backup Database: In NOARCHIVELOG mode (the default), shuts down the database, backs it up, and then restarts it. In ARCHIVELOG mode, performs an online backup of the database. For more information on backups, see Oracle Database Express Edition 2 Day DBA. Restore Database: Shuts down and then restores the database to the most recent backup. For more information on restoring a database, see Oracle Database Express Edition 2 Day DBA. where username is the user name, such as system or another user account name, and password is the password that was assigned when Oracle Database XE was installed or when that user was created. To get help, you can enter the command help at the SQL prompt after you have connected to the database. Start Database: Starts Oracle Database XE if it is currently stopped. By default, the database is started for you after installation and every time your computer is restarted. However, to reduce the overall performance load on the system, you can manually stop the database, and then manually restart it later. To start or stop the database: On Windows, you must be logged in as the user who installed Oracle Database XE or as a Windows administrator; on Linux, you must be logged in as the user who installed Oracle Database XE or as a user who is a member of the dba user group (typically the user oracle). Stop Database: Stops Oracle Database XE if it is currently started. Get Started: Displays the Oracle Database XE Home Page in your default browser. See Section 1.2, "Database Home Page". On Windows, from the Start menu, select Programs (or All Programs), then Oracle Database 11g Express Edition, and then Get Started. On Linux, click the Application menu (on Gnome) or the K menu (on KDE), then point to Oracle Database 11g Express Edition, and then Get Started. For detailed information about these database-level operations, see Oracle Database Express Edition 2 Day DBA. Click the button or tab for any category you are interested in (for example, Storage). Username: Enter system for the user name. Password: Enter the password that was specified when Oracle Database XE was installed. You should create at least one database user that you will use to create database objects. A database user is a type of database object: a user is associated with a database schema, you connect to the database as a database user, and the database user is the owner of any database objects (tables and so on) that you create in the schema associated with the user. Display the SQL command prompt window. For example, on Windows, click Start, then Programs (or All Programs), then Oracle Database 11g Express Edition, and then Run SQL Command Line. Create a database connection for the SYSTEM user. Open that database connection for the SYSTEM user. Right-click the Other Users node in the Connections navigator under that connection. SQL Developer is a graphical tool that enables you to browse, create, edit, and delete (drop) database objects; run SQL statements and scripts; edit and debug PL/SQL code; unload (export) and load (import) data; migrate third-party databases to Oracle; and view metadata and data. The instructions in this guide use SQL Developer for getting started with database development. SQL Developer is not packaged with Oracle Database Express Edition, but it is easy to download and install SQL Developer. Much of the Express Edition documentation assumes that you have installed SQL Developer. Application Express is a rapid web application development tool for developing and deploying professional applications. Application Express has more limited object-creation features than SQL Developer, but Application Express allows you to create form-based applications quickly. This guide includes sections that explain how to create such an application. Application Express is packaged with Oracle Database Express Edition, so no separate download or installation is needed. If a Windows 64-bit SQL Developer kit that includes JDK 7 is available, you can download and install that on a Windows 64-bit system, and SQL Developer will use the embedded JDK that is provided with that kit. However, if you need or simply want to use a JDK on your Windows 64-bit system, you can install the JDK (if it is not already installed) and the Windows 32/64-bit SQL Developer kit, and SQL Developer will use the JDK that is installed on your system. On the SQL Developer Downloads page (http://www.oracle.com/technetwork/developer-tools/sql-developer/downloads/index.html), click the Download link next to SQL Developer requires JDK 7 or above. On the Java SE Development Kit 7 Downloads page, in the table of Java SE Development Kits, accept the Oracle Binary Code License Agreement for Java SE. Click the link for the download that you need (for example, the Windows x64 link for a Windows 64-bit system). Save the file anywhere on your system (such as a "temp" folder). Install the JDK (for example, on Windows, double-click the .exe file name and follow the displayed instructions). On the Oracle Technology Network page for SQL Developer at http://www.oracle.com/technetwork/developer-tools/sql-developer/, click the Downloads tab (next to Overview). Follow the instructions for downloading and installing SQL Developer. The installation itself is simple. For example, on a Windows PC you can unzip the downloaded file into C:\, which will create C:\sqldeveloper with files and folders in and under it. If you are asked to enter the full pathname for the JDK, click Browse and find it. For example, on a Windows system the path might have a name similar to C:\Program Files\Java\jdk1.7.0_51. Install and start SQL Developer, as explained in Section 3. Create some database connections, as explained in Section 4.1. Connect to the database and work with database objects, such as by doing the tutorial described in the online help, as explained in Section 4.2. 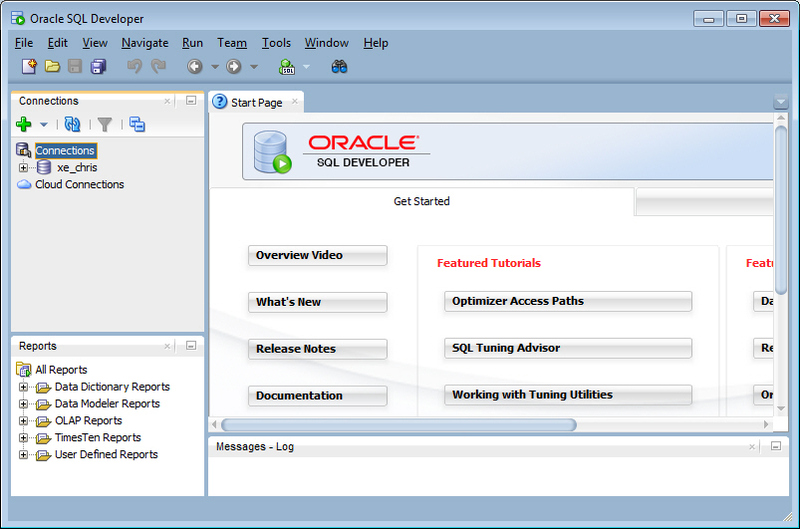 SQL Developer comes with a tutorial and demos to help you learn to use its features. To work with your Express Edition database in SQL Developer, you must create some database connections, so that you can view and work with database objects, use the SQL Worksheet, and use other features. Instead, you must create individual database connections manually, as explained in this section. You can create database connections to the local Express Edition database and to Oracle Database instances on other systems. If you create a connection manually, you can specify the Save Password option to avoid having to enter the password each time you connect, and you can edit the user name and password associated with then connection. In the Connections navigator, right-click the Connections node and select New Database Connection. Use the dialog box to specify information about the connection. Figure 1 shows the information to create a connection for a database user named CHRIS. Description of "Figure 1 Creating a Database Connection"
Password: Password associated with the specified database user. Save Password: Specify this option if you want the password is saved with the connection information; you will not be prompted for the password on subsequent attempts to connect using this connection. Hostname: Host system for the Oracle database. For your Express Edition database, the hostname is localhost. Port: Listener port. The default is 1521. SID: Database name. The default for Express Edition is xe. Click Test to check if you have entered the correct information for the connection. If the test is not successful, correct information as needed and click Test again. When the test is successful, click Save to save the connection. 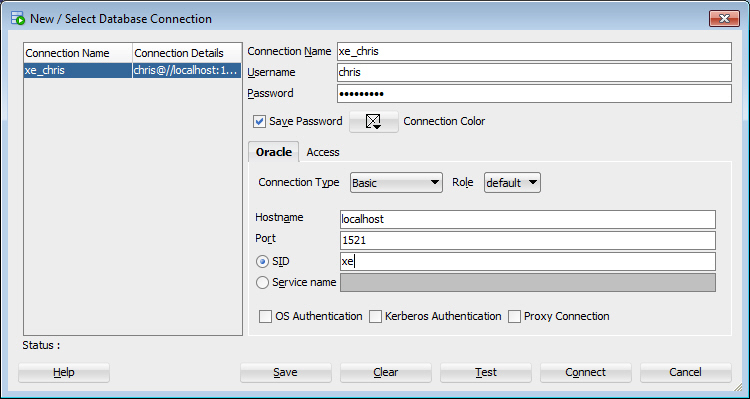 Figure 2 shows the SQL Developer main window after the xe_chris database connection has been created. Description of "Figure 2 SQL Developer Windows After Database Connection Is Created"
To get started quickly working with database objects, do the short tutorial in the SQL Developer online help (also available in Oracle SQL Developer User's Guide). This tutorial creates three tables, a sequence, a view, and a PL/SQL procedure for a small library database, and inserts some sample data into the tables. You can create these objects using a database connection to a user that you created (such as one to CHRIS if you used that example). Click Help, then Table of Contents. In the Contents navigator, double-click the topic Tutorial: Creating Objects for a Small Database. Follow the instructions for the major steps in the tutorial. You can also check the many tutorials, demos, courses, and other resources mentioned on the SQL Developer Start Page and on the Oracle Technology Network. To view any objects owned by the supplied sample database user named HR, or to create the form-based application as described in Section 6, "Creating an Application Using Application Express", you must first unlock the HR sample account. If you have not already created a database connection for the SYSTEM user, do so following the basic steps in Section 4.1, "Creating Database Connections"; however, specify an appropriate connection name (such as xe_system) and the user name and password for the SYSTEM user. Open the database connection for the SYSTEM user. In the Connection navigator under the connection for the SYSTEM user, expand the Other Users node. Under Other Users, right-click the node for the HR user and select Edit User. In the Create/Edit User dialog box, uncheck (deselect) the option Account is Locked. For New Password and Confirm Password, enter the password that you want for the HR user. Uncheck (deselect) Password expired (User must change next login). Uncheck (deselect) Account is Locked. Click Apply to alter the HR user so that the account is unlocked and not expired. From the system menu, navigate to Oracle Database 11g Express Edition and select Get Started. On the Database home page, click Application Express. On the Login page, log in with the user name and password for the SYSTEM account. On the Oracle Application Express page, create a workspace for the existing database user HR, as shown in Figure 3. Description of "Figure 3 Creating an Application Express Workspace"
Database User: Specify Use Existing to create the workspace for the existing database user named HR. Password and Confirm Password: Enter the password to be used for the Application Express workspace. On the next page, click the click here link to log in to the workspace. To create the application, you must log in to the workspace that you created in Section 6.1, "Getting Started with Application Express". On the Login page, click the button Already have an account? Login Here. Log in to the Application Express workspace. Now you are ready to create your first application using Application Express. Creating an application is an easy way to view and edit your database data. You create this application based on the EMPLOYEES table, which is part of the HR schema. On the Application Express page for the workspace, click Application Builder. Under Create Application, for Application Type select Database and click Next. 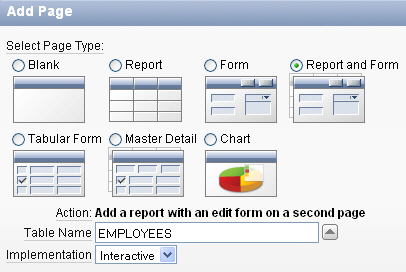 Page Type: Report and Form. Table Name: Click the up arrow, and then select EMPLOYEES. Two new pages are listed at the top of the page, under Create Application. On the Tabs panel, accept the default (One Level of Tabs) and click Next. On the Shared Components panel, accept the default (No) and click Next. This option enables you to import shared components from another application. Shared components are common elements that can display or be applied on any page within an application. On the Attributes panel, for Authentication Scheme select the default (Application Express) and all remaining defaults, and click Next. On the User Interface panel, select Theme 2 click Next. Themes are collections of templates that you can use to define the layout and style of an entire application. On the Confirm panel, confirm your selections. To return to a previous wizard page, click Previous. To accept your selections, click Create. Click the Run Application icon. You can query the EMPLOYEES table, if you want. To manage the application, use the Developer toolbar at the bottom on the page. The Developer toolbar offers a quick way to edit the current page, create a new page, control, or component, view session state, or toggle debugging or edit links on and off. To exit your application and return to Application Builder, click Edit Page 1 on the Developer toolbar. To return to the Database Home Page, select the Home breadcrumb at the top of the page. Congratulations! 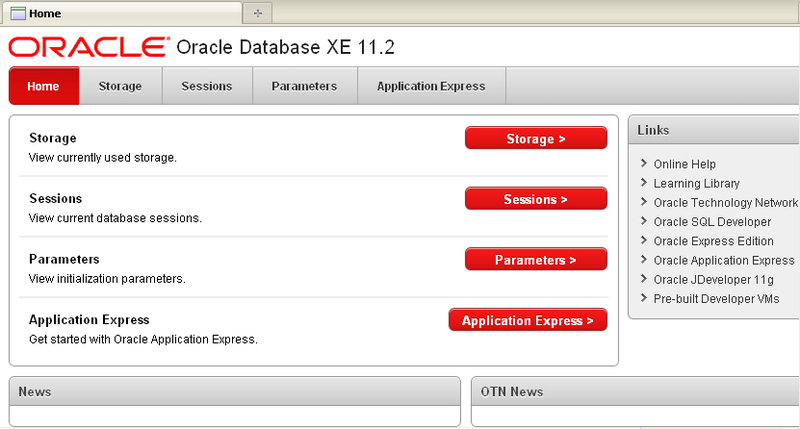 You have just created and run your first application using Application Express with Oracle Database XE. To learn more about using Oracle Database XE, you can use the Oracle Database XE Documentation Library, which is available from the system menu (Start > All Programs > Oracle Database 11g > Get Help > Read Documentation) or the administrative console. Discusses common day-to-day administrative tasks. Explains how to take advantage of the Oracle Database Express Edition development environment. Offers a series of tutorials that describe how to build database-centric web applications using the Oracle Application Express client. Provides a tutorial that shows you how to download and install Apache and the Zend Core PHP drivers, and then how to use PHP to connect to Oracle Database XE, and demonstrates how to use PHP to develop a simple application that accesses and modifies data. Provides a tutorial that shows you how to use Java and JDBC to connect to Oracle Database XE, and demonstrates how to develop a simple Java application that accesses and modifies data. Describes the key features of Oracle Data Provider for .NET and Oracle Developer Tools for Visual Studio .NET. It leads you through installation and configuration, shows how to build basic applications using Oracle Data Provider for .NET and Oracle Developer Tools for Visual Studio .NET, and how to create and use both PL/SQL and .NET stored procedures. If you have a problem using the Express Edition product, see the Oracle Database Express Edition (XE) discussion forum (https://community.oracle.com/community/developer/english/oracle_database/oracle_database_express_edition_(xe)). You can search that forum to see if the problem has already been discussed; and if you do not find the answer, you can create a new thread and provide the details. This section summarizes the major changes between Oracle Database XE Release 11.2 and the previous release (10.2). The most obvious difference is in the user interface, specifically the Database Home Page, as explained in Section 8.1. The resource limitations are the same as for Release 10.2, except that you can now store up to 11 GB of user data (not including Express Edition system data), as opposed to 4 GB in Release 10.2. Oracle Database XE Release 11.2 contains a vast set of Oracle Database features that have been introduced since Release 10.2. In general, Oracle Database XE Release 11.2 contains the features of Oracle Database Standard Edition Release 11.2, except as qualified in Oracle Database Express Edition Licensing Information. See that manual for detailed information about features that are and are not included in Oracle Database XE. In Oracle Database XE Release 11.2, you can use the Database Home Page to perform various database administration tasks, including monitoring database storage, monitoring database sessions, and viewing database initialization parameters. To access Oracle Application Express, click the Application Express button on the Database Home Page and follow the instructions. Once you create a workspace, username, and password, you can access Oracle Application Express directly from your web browser as described in Oracle Database Express Edition 2 Day + Application Express Developer's Guide.